Buckingham Palace. It's on most every tourist's list while visiting London. Many people torment the guards, and watch the changing of the guards at 11:30 every day in the summer and every other day in the winter, and move on, missing the inside and grounds tours. 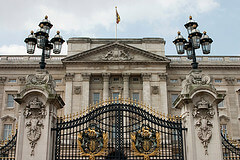 Buckingham Palace, or 'Buck House', is a working residency for the royal family. Her majesty the Queen resides there most of the time. It has been a house for the Royals since 1837 when Queen Victoria moved them there. While the Queen is away in the summer, the State rooms are open to the public. A Union flag will be flying to tell you she isn't home. The lavish, opulent furnishings are what might be expected of royalty. It has to be taken in slowly, or you might overload on gold trims and fringe. While the inside is magnificent, don't miss the grounds. The Royal Mews houses the presentational carriages and horses. If you have been worn down by touristing, the Buckingham Palace Gardens is a retreat; it's a chance to relax, sit in an oasis, and listen to the birds. The Queen's Royal Gallery is not only a chance to see Rembrandt and Vermeer, it is a chance to think. The only damage sustained by Buckingham Palace during the London Blitz, was to the chapel, bombed seven times, which used to stand in that very spot. It's kind of chilling. Finally one of the best bargains available is 'The Royal Day Out' Pass, which allows 12 months to tour the entire grounds. Some tips for a fuller experience: look at the ceilings, they are all decorated, take the audio tour, and visit the Royal Gift Shop where the Queen personally picks out limited edition China and crystal, available for visitors to buy. Last updated by Tracy Huddlestun on 12 March, 2013 in Destinations. I loved visiting Buckingham Palace when I went to London! It is so massive and beautiful. The changing of the guards was a very cool ceremony -- it felt so regal. The grounds of the palace were just gorgeous. We don't have anything like that in America, so it's pretty thrilling to be at a castle like that! I have been to London several times and have never stopped to see the palace which is a shame. I must get to see it someday, I have heard brilliant things. I watched the changing of the guards last time I was there and I liked it.